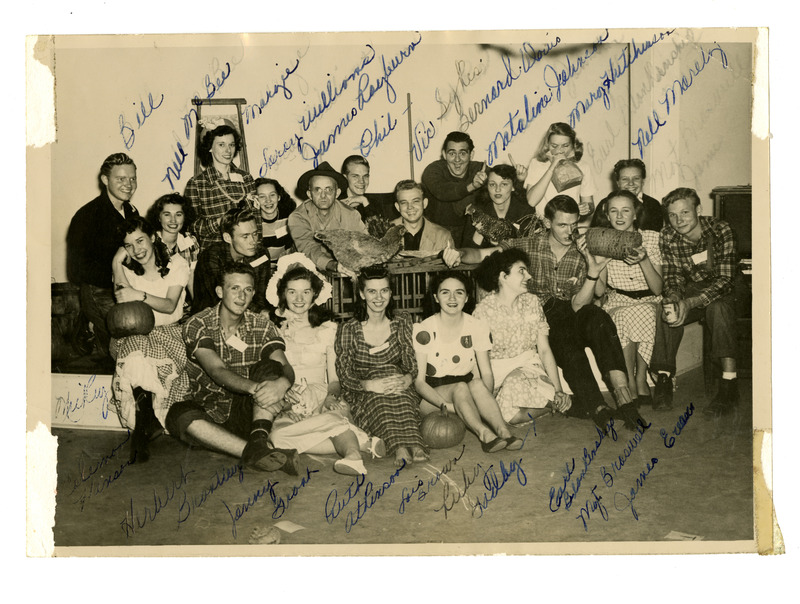 A large group of people identified by handwriting (both blue ink and pencil) on the photo itself. 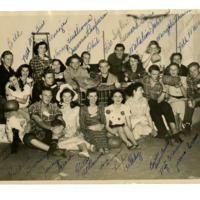 Back row left to right: Bill, Nell McBee, Margie, Lorey Williams, James Rayburn, Phil, Vic Sykes, Bernard Davis, Mataline Johnson, Mary Hutchinson, Nell Moretz. Front row right to left: James E, Margaret Braswell, Earl Blankenship, Ruby Gadby, Lois Brown, Ruth Atkinson, Jenny Grant, Herbert Brantley, Coleman Hanson, Mickey McGuire. All are wearing 19th century style clothing. James Rayburn holds a chicken on a wooden cage. Mary drinks out of a bagged bottle. Mataline also holds a chicken. Margaret holds a moonshine jug and feeds it to Earl. There is a pumpkin at Lois's feet and one in Mickey's lap. Vic gives Mataline "bunny ears" from behind. 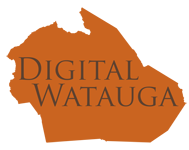 Palmer Blair, “Costumed Group with Chicken,” Digital Watauga, accessed April 19, 2019, http://digitalwatauga.org/items/show/5833.